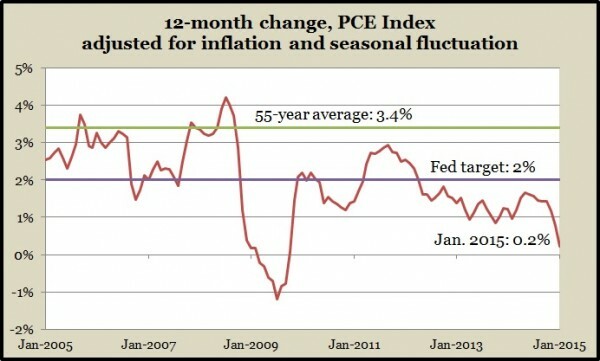 Inflation, it seems, is on everybody’s mind – from the head of the Federal Reserve Board to the individual investor. Near historically low levels, inflation eventually will be picking up, but it is not expected to get out of control, and it is certainly not something to worry about right now. Nevertheless, as we look forward, both inflation and rising interest rates will become part of the landscape, and investors need to understand what bond and stock strategies make the most sense for their portfolio. The pace of rising rates will dictate what bond strategy to use. When the Fed begins to hike interest rates, as it is expected to do later this year, it will be a signal of confidence in economic fundamentals, not an indication that inflation is out of control. Understand that the Fed’s purpose in raising the overnight rate from the crisis-era level of 0% is to accommodate and complement a growing economy. We are no longer in a crisis, and the Fed’s monetary policy should reflect that. Your bond portfolio should reflect that, too! It is not a question of if rates are going up; it’s an issue of how fast. We can learn from history and ask whether the next rate hikes will like 1994 or 2004? In 24 months, the Fed telegraphed 17 raises that boosted the rate from 1% to 5.25%. In 1994, the Federal Reserve blindsided the market by raising rates without warning. The only fixed-income strategy that made sense was to go to cash because the abrupt rise in rates overpowered the ability of bond yields to cushion against the drop in bond prices. The Federal Reserve learned a lot from 1994 and changed its strategy 10 years later by making gradual changes and telegraphing their moves months in advance. The strategy that made the most sense in 2004 was to stand pat in high-quality intermediate-term bonds. That worked in 2004 because as bond prices gradually declined along with the rise in interest rates, the bond yields provided a sufficient buffer, and investors were net ahead of the cash alternative. The Fed appears to be using the same approach as they did in 2004, which points to a strategy of again holding on to your intermediate-term bonds. Furthermore, the Fed might take many years to get back to neutral on the overnight rate, and neutral might mean 2.5%, not 3%, its average over the last 20 years. This is another reason why intermediate-term bonds will likely outperform cash and be the most appropriate fixed-income strategy when rates begin to rise. Mild inflation and gradually rising rates can be good for stocks. Remember that both interest rates and inflation are expected to rise because economic activity is on the rise. Businesses tend to do well in that environment, which means you should maintain a prudent exposure to stocks. Wages: Through February, the average hourly wage rose less than 2% a year, below the post-recession average. Capacity utilization: Federal Reserve data show U.S. industries using only 78.9% of the production capacity available in February, staying below the 40-year average of 80.1% since the summer of 2000.
Commodities: Even aside from the steep drop in oil prices since, the price for copper, a key indicator of global industrial demand, was recently 41% below its 2011 peak. Long-term, the market moves on interest rates and earnings. While nominal corporate earnings can be volatile year-to-year, real (inflation-adjusted) earnings are relatively stable. Franco Modigliani, a professor at MIT, won a Nobel Prize in economics for a body of work that included showing that stocks are an excellent hedge against inflation. Since 1983, the S&P 500 has averaged a 9% return in the four months following the Fed’s very first increase of the Fed Funds Rate. It is only in the latter innings of rate increases that stocks and bonds begin to come under pressure, as inflation gets persistently high, and the Fed aims its rate increases to slow economic growth. Now is not the time to worry, because inflation remains stubbornly low, and we haven’t even begun the first inning of rate increases yet. While inflation is likely to rise in the future, it is not expected to get out of control, and it is not something we need to worry about now. Nevertheless, investors need to understand what strategies make sense when inflation and interest rates return to normal: Keep your bond duration intermediate, and have an appropriate exposure to stocks. Remember, a balanced portfolio is still the best approach for investors to help navigate the road ahead. Adam Baley is a registered representative and investment advisor at Landaas & Company.